Hey all! Ready for Dashboard 2? We’re going to find people that matter to you in that sea of 32,600 unique first names on 20th century social security cards. In the tutorial, I’ve picked names from the past four generations of women in my family. The line graph creates one line per name, allowing me to see how those names have changed over time, and it turns out everyone except my great-grandmother Gretchen received a name that was very much of its time. When you click on any name’s line, the two pieces of text dynamically appear, and so does that little dotted line. It’s not just an aesthetic divider; it’s a visualization in its own right. Let’s build! Dashboards 1 through 5 all use the same data. 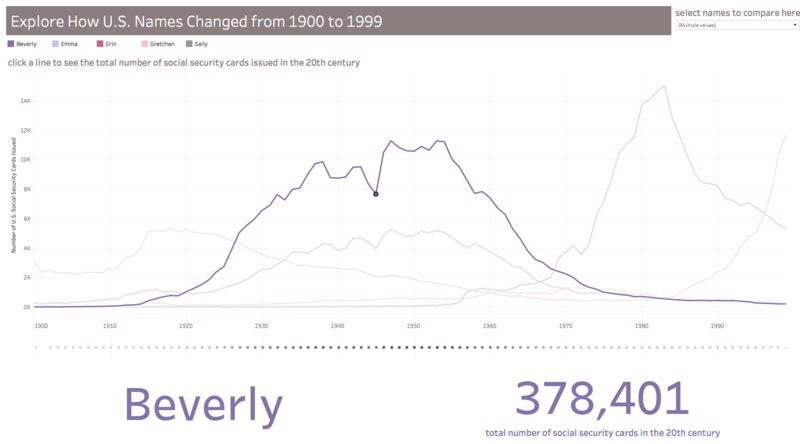 It’s a super simple data set (seriously, it’s just four variables) and it’s all about first names from U.S. social security cards in the 20th century. Click here to download the data and create your own dashboard along with the videos. This is the best way to build up those Tableau skills! If you haven’t used this data before, check out Dashboard 1: Step 1 for a quick overview of the data and instructions on how to connect it to Tableau Public. Thanks to Data.gov for making data like this public! Well done! Rocking the dashboard actions with multiple visualizations. Share your beautiful dashboard by adding your Tableau Public profile below. And don’t forget to add your opinion on Dashboard 2: what you love, what you don’t, and what you want to see in future videos. Thanks so much for building with me!